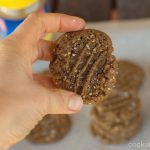 A sunflower seed butter cookie that’s vegan, Paleo, nut-free and no refined sugar, and oh so tasty ! As I’ve been going through life, and making many peanut butter recipes (think here, here and here for just some examples), I’ve just started to come across other nut and seed butters. I have a particular liking for almond butter. And tahini (sesame seed butter). But also sunflower seed butter. Particularly good for when you need to make something for someone who has nut allergies. So I thought I’d try a few things out with substituting peanut butter with sunflower seed butter. Hence this sunflower seed butter cookie recipe was born. Based on my vegan peanut butter and jelly cookie (recipe here), I changed a few things but continued to make it vegan and Paleo-friendly. 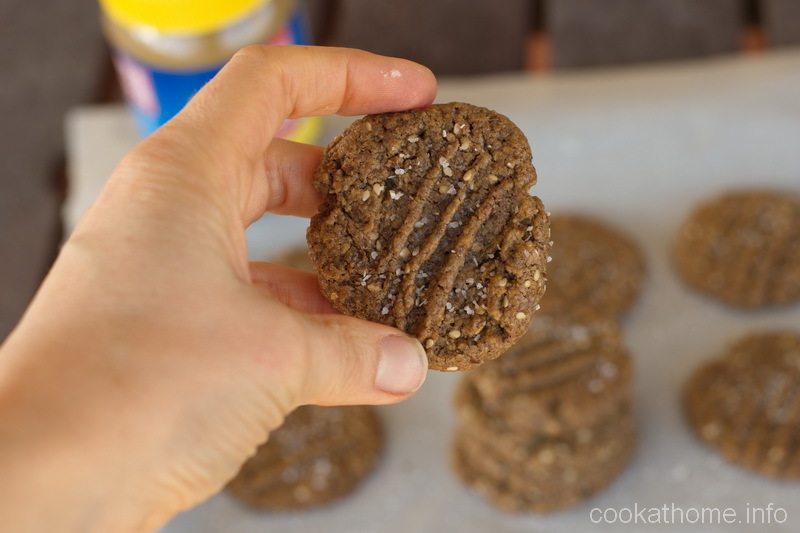 As with all of these types of cookies, the flourless content makes it a little sticky on the top of your mouth, but the raw sunflower seeds add a little extra crunch to it all. I’m thinking if you toasted the seeds, they might be even more crunchy! The salt sprinkled on top is just something I thought of at the last minute, but really gives the taste a lift! I had some coupons for jars of Sunbutter, which is an awesome company (and who I am in no way affiliated with … yet! ), so I bought some of their natural sunflower seed butter to give this recipe a try. Normally, when I’m having my applesauce and trail mix breakfast, or apple and bacon breakfast, I’ll use the organic sunflower seed butter as it has no added sugar, but since I’m adding some sugar, albeit coconut sugar, I thought I’d go for the natural variety this time! And it works. I like it. A lot. So please try it and let me know what you think! Preheat oven to 350F and prepare 2 baking trays with parchment paper. Mix all ingredients together in a medium mixing bowl until very well combined. Scoop by tablespoon-fuls of batter and drop onto the parchment paper. Place in the middle of the oven and bake for 10 minutes. After removing from oven, sprinkle coarse sea salt on top of all cookies. Leave on tray for at least 10 mins before moving to a wire rack to cool completely.